An exclusive MapLight review of Agriculture Secretary nominee Sonny Perdue’s emails raises questions as he heads into a confirmation hearing. This article was produced by MapLight in partnership with Civil Eats. Bret Hendry and Margaret Sessa-Hawkins contributed reporting. Former Georgia Gov. 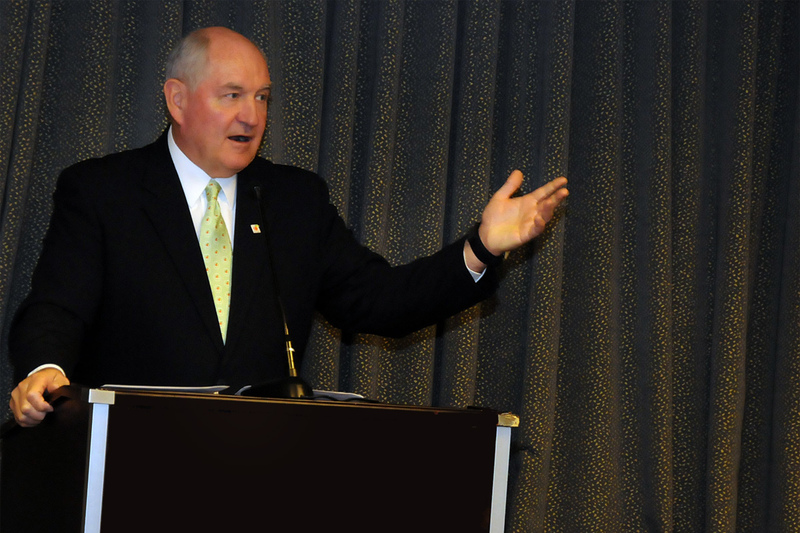 Sonny Perdue, the president’s nominee to head the U.S. Department of Agriculture (USDA), was convinced in June 2016 that his grain merchandising business faced a threat. At least two children had become ill from peanut residue in Hostess products made with wheat from Georgia, and the company would eventually be forced to ask consumers and retailers to return 710,000 cases of snack cakes and donuts. As the state’s first Republican governor since Reconstruction, Perdue was familiar with food safety issues. He had cut the state’s food safety budget by almost one-third in 2006. Less than one year later, a salmonella outbreak at a Georgia peanut butter plant resulted in 625 people becoming sick. The case was resolved almost a decade later with an $11.2 million fine, the largest food safety penalty in U.S. history. Another shoe dropped in 2008, when peanut paste tracked to a Georgia facility killed nine people and sickened more than 700. The company’s chief executive was later sentenced to 28 years in prison. When the 2016 Hostess recall struck, Perdue correctly assumed that the peanut residue had been mixed with the grain meant for Hostess in transit. Even so, he evidently feared that the government would quarantine Georgia wheat. As a middleman who bought grain from farmers and sold it to larger conglomerates, Perdue’s business might have suffered if national concerns were raised about the safety of Georgia wheat. Emails obtained by MapLight suggest Perdue was more preoccupied by the potential for government regulation than the possibility of more sick children. “It is a sad day in America with all the challenges of business, that it seems that our biggest threat today is the government that is supposed to represent us,” Perdue complained to Pete Frederick, the head of Grain Craft, the Tennessee company that had supplied the contaminated grain. The former governor also apparently lobbied the state’s agriculture commissioner to make the case that the contamination was a transportation problem, rather than a problem that should be associated with Georgia wheat or peanuts. “We will make the case,” Gary Black, the state’s agriculture commissioner, promised the former governor. Ultimately, the recall would affect at least a dozen companies and prompt a new government rule to ensure that food doesn’t come into contact with allergens during transport. While the incident highlighted Perdue’s lack of trust in federal regulators, it also underscored the former governor’s willingness to use connections in state government to protect and expand his business empire. Perdue entered state politics in 1991 when he was elected to the Georgia Senate. He served there for more than a decade before taking over as Georgia’s governor. Roughly $1 million of the $20 million total that he’s raised during his political career has come from the agriculture sector, according to data from the National Institute of Money in State Politics. Perdue continued to run his family businesses while serving as the state’s governor from 2003 to 2011. It wasn’t always a comfortable fit. The state’s ethics panel received 13 complaints against him, found the governor violated ethics laws twice, and fined him while he was in office. As governor, Perdue appointed his cousin David (now a U.S. senator from Georgia) to the board of the Georgia Ports Authority and met with its officials to discuss using a Savannah terminal for his family business. Upon leaving the governor’s mansion, he created Perdue Partners, a global trading company. The former governor used connections from his eight years in Georgia’s highest office to benefit his company, including a state economic development office in China that he created. Even as President Donald Trump has claimed the Chinese are “grand champions” of currency manipulation, the world’s most populous nation was the second-largest market for U.S. agricultural exports in 2015. Perdue’s company sought to take advantage of that growth, asking the state’s economic development agency for assistance in exporting “shelf-stable” milk products that can sit on a shelf for more than a year. State officials in Beijing arranged for the company to meet with online grocery businesses and a dairy distributor, as well as the U.S. Agricultural Trade Office in Shanghai. Emails obtained by MapLight show that Perdue Partners also coordinated a trip for a delegation from Tianjin, a northeastern China coastal city of 15 million people, to locate Georgia products that could be imported. Perdue Partners hoped to arrange meetings with Tianjin importers on behalf of Georgia’s peanut business, which accounts for roughly half of the annual U.S. production, as well as pecan growers, who produce a world-leading 88 million pounds of nuts on average every year. The state’s economic development agency held a presentation to the delegation in its boardroom, according to the emails. Despite Perdue’s use of the revolving door to build his business empire, the former governor will only face token opposition at his Senate confirmation hearing scheduled for Thursday. Records filed with the Senate show Perdue has agreed to put his assets into a blind trust and step down from several positions, which may be a case of good timing. Export businesses are likely to suffer if President Donald Trump’s initial budget survives congressional scrutiny. The White House would slash the U.S. Commerce Department’s budget by 18 percent, taking a cleaver to the budgets of several agencies that promote international trade. His own department, the USDA, will suffer a 21 percent decline in discretionary spending in its $17.9 billion budget under the Trump plan. Despite the potential for either a trade war with China or a reduced export market, Perdue apparently will have the opportunity to help the administration roll back regulatory reforms that were meant to ensure food safety. The administration is already reviewing an Obama-era rule that makes it easier for chicken farmers to sue the heavily concentrated processing industry over unfair business practices. The Farmer Fair Practices Rule is supported by the National Farmers Union but opposed by a half-dozen major industry lobbying groups, including the National Chicken Council, the National Cattlemen’s Beef Association, the National Pork Producers Council, the American Meat Institute, the National Meat Association, and the National Federation of Independent Business. The six organizations supporting the rule have spent $53 million lobbying the federal government since 2008, according to a MapLight analysis. The future of U.S. food safety law also appears likely to land on the new secretary’s table. The Regulatory Accountability Act of 2017 passed by the House in January would end the long-standing precedent of federal court deferment to regulatory agencies. The legislation is opposed by almost a dozen public interest groups, which said in a Tuesday letter to U.S. Senate leaders that the bill “more aptly should be named the ‘Filthy Food Act.’” Almost 50 million Americans become sick from food every year, resulting in 128,000 hospitalizations and 3,000 deaths. Meanwhile, the measure “would paralyze the federal response to emerging public health and safety threats,” wrote the organizations, which included the Environmental Working Group, Consumers Union, and Public Citizen. Photo courtesy of the U.S. Embassy in Uruguay.